This new book from Ian Baxter delves into an important topic surrounding World War II, one that breaks new ground for Concord Publications. The focus is U-boats (untersee-boot, or "undersea boat”) and their campaign against Allied shipping during the course of WWII. Germany constructed an impressive 1171 U-boats in the war years. 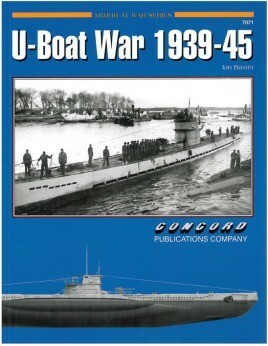 Unfortunately, due to sales rights restrictions, we cannot offer 7071: U-Boat War 1939-1945 for sale in your country. This new book from Ian Baxter delves into an important topic surrounding World War II, one that breaks new ground for Concord Publications. The focus is U-boats (untersee-boot, or “undersea boat”) and their campaign against Allied shipping during the course of WWII. Germany constructed an impressive 1171 U-boats in the war years. Such was the significance of this deadly battle for the seas that the Allies lost more than 50,000 seamen and 15 million tons of shipping from 1939-45. Indeed, particularly early on in the war, German submarines created a stranglehold on the Atlantic that starved Great Britain of much-needed supplies. However, as the tide turned, submariners found they had become the hunted, with 319 U-boats sunk between June 1944 and May 1945 alone. Nearly 40,000 German submariners lost their lives in this desperate battle. This volume traces the development of the U-boat as a strategic weapon in Germany’s arsenal. The book begins with a written description of the tactics employed and how their effectiveness ebbed and flowed as the war progressed. However, the backbone of this work is the many black-and-white photos of U-boats and their crewmen. These contemporary photos show German Navy submarines in port and at sea, as well as various details of their construction. The crewmen are also a focus of the photography, offering readers a study of their typical uniforms and appearance. The book includes colour plates showing various U-boat types and provides an invaluable insight into this naval aspect of WWII, and the superb collection of photographs aided by detailed captions will greatly increase the knowledge of readers. For enthusiasts seeking wider coverage of this early-war period, “Early Panzer Victories” is a handy reference. Well written and well-presented, this work offers many new photos for readers to study and examine. ... you"ll find a fascinating collection of wartime images depicting the various types of U-Boats and their crews, which includes numerous close-up photos that model makers in particular will no doubt find of great interest. All in all a good new book on the topic of the U-Boat in WW2, and a useful one for both modellers and those just interested in the history of the whole subject. ...it's well done and illustrated with plenty of evocative photos of the boats and their crews.